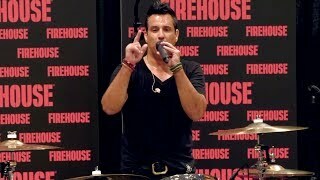 Rich Redmond is a charismatic, high energy speaker who mixes music and motivation to create a passion fueled, one of a kind "Edu-Tainment" experience for his audiences. As the recording and touring drummer for two time ACM Entertainer of the Year Jason Aldean, Rich has spent 10+ years sharing with others how Commitment, Relationships, Attitude, Skill and Hunger (C.R.A.S.H) provided the framework to successfully navigate the most difficult business on the planet, the music business, and put him at the top with over 20 recorded #1 hits. Following the deadly Las Vegas shooting in October 2017, Rich found himself turning to the same platform as the foundation for his personal recovery having been onstage as the tragedy unfolded. Rich shares how in the weeks following the shooting he used C.R.A.S.H to move forward and stay focused on a positive outcome. Rich's customizable and universal message combines thoughts on Sales, Leadership, Adversity, Attitude, Goals, Passion, Entrepreneurialism and much more. Whether playing sold out shows to 80,000 fans in a stadium, performing on the Grammy Awards or sharing his message with YOUR team; Rich was born for the stage. •	Skills in applying the C.R.A.S.H philosophy in times of hardship. •	Goal setting like a "ROCKSTAR"
•	Leaders will understand how to accelerate actionable change in the most challenging environments. •	Employees will gain a take away of unity that takes your corporation to a new level. •	Sales and Business Development professionals will learn techniques that will boost their sales.